How Much Will This Porsche 959 Prototype Sell For? UPDATE: This 959 sold at auction for $400,000 plus a 10% buyer's premium. A surprisingly low price in our mind. 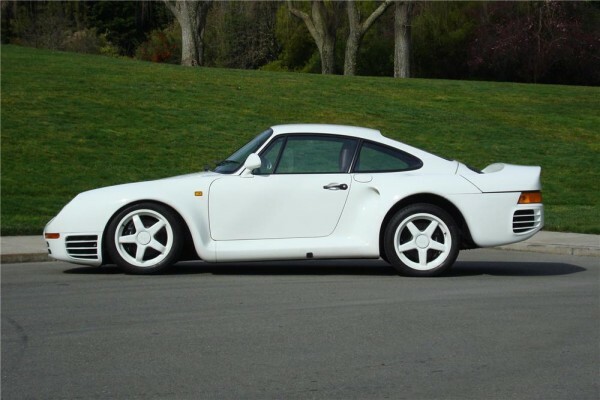 AT $440k it traded in the same range as a "regular" 959. There was little or no value paid for prototype status. Watch the video below to see it cross the auction block for yourself. In just a few days one of the original Porsche 959 factory prototypes will come across the Barrett-Jackson auction block in Scottsdale. Said to be one of only four surviving prototypes and one of only two running survivors this is among the rarest of the rare when it comes to Porsche sports cars. Barrett-Jackson's listing gives extensive details on the provenance of this Porsche 959. Specifically it details how for three years Porsche engineers studied and worked on 959 prototypes and designs prior to its debut at the 1985 Frankfurt Motor Show. It goes on to explain that these early pre-production models actually carried Porsche 930 Turbo chassis numbers. In 1985, Helmut Bot, head of the 959 development, took 29 of these 930 chassis to turn them into 959 prototypes coded F, N and V. They were then used for road tests, crush tests and media coverage. The 959 up for auction is one of seven V-series prototypes. Amazingly most of the 29 prototypes were destroyed by Porsche leaving just four intact. This 959 is so correct it is said to not only have the proper prototype wheels, but the original pre-production Dunlop tires as well. Porsche is no longer releasing/selling prototypes to the public so it's highly unlikely an opportunity like this will ever present itself again. With just over 300 959s produced for sale this is truly a "holy grail" type opportunity. What do you think will be the final price by the time the hammer falls on this very special Porsche? The 42nd annual Barret-Jackson Scottsdale auction will be held January 13th to the 20th. More info can be found on the Barrett-Jackson web-site and SPEED will have lots of TV coverage starting tonight at 10:00PM EST. Why Hasn't This Porsche 962 Sold? Porsche Claims 4 of the Top 10 Mecum Auction Results in Monterey, Including a New World Record! Ring a Bell? Why hasn’t this 962 sold? I’ve never seen the rear of a 959 riding so high. Seems strange. I thought at first the car is missing its motor but that’s not the case. Maybe more details will come out around auction day. Was this car for sale to the public in the mid 80s? I could have sworn I saw one on a trip to LA. Great car. Not a fan of white but you ignore the color when bidding on something so rare. We mentioned the same things in the pictures we posted on our Facebook page. Most likely there’s a problem/leak in the air suspension system causing it to have such a “muscle-car” like rake to it. Not sure if it was for sale before. We have calls into a few people who would know, but haven’t heard back as of yet.